Locally adapted high quality seeds are a rare commodity and cost nothing but patience. Then you avoid spraying pesticides that are necessary for over-bred, highly-strung varieties of fruits and vegetables. Moreover, your efforts may become the start of a seed swap adventure with other gardeners (or in your local seed network), whether with neighbours, family and friends, in a community gardens or in a school. 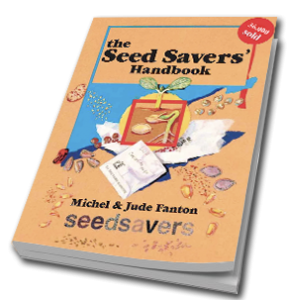 Having met farmers and gardeners in more than forty countries Jude and Michel Fanton, the directors of The Seed Savers’ Network, appreciate that it is gardeners and small land-holders who caretake the food diversity of the world. They are leaving us the living legacy of home-saved seeds that ultimately belong to all of us, and are the responsibility of all of us. Seed saving peasants, rural and urban gardeners worldwide keep their seed within a friendly active network, and regrow them in their fields and gardens as a living seed bank evolving within culture, and within climate. Institutionalised frozen gene-banks are inaccessible to gardeners and farmers. Increasingly even small seed companies are relying on large corporations for their seed supply. To remain independent of Big Seed, an increasing number of gardeners and peasant farmers, urban gardeners, small rural landholders are saving their own and gifting and exchanging their seeds with other who also do. No amount of rethoric will change anything. However educating ourselves with other seedsavers in Local Seed Networks do. 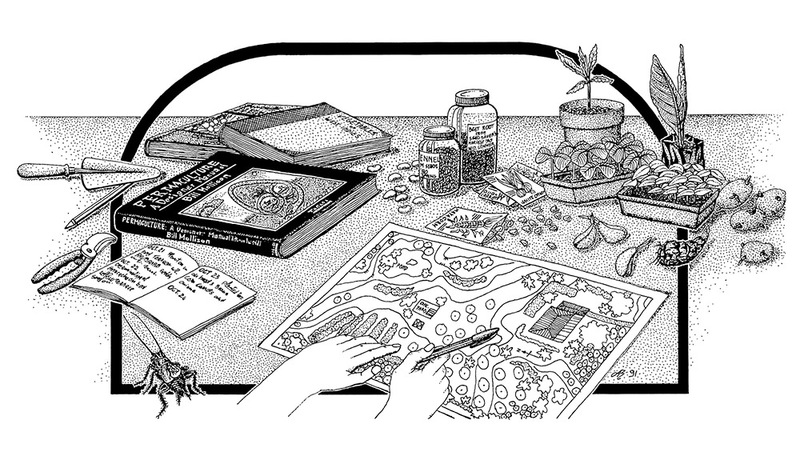 Start by letting a few plant run to seeds in your seedsaving garden, learn from observations even mistakes, and consult the classic The Seed Savers’ Handbook. 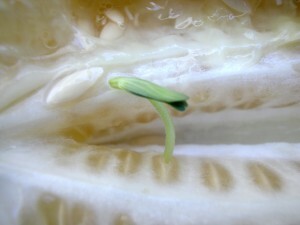 When you produce your own seeds you avoid the recurring expense each year. One gram of corporate hybrid tomatoes cost around $30 upwards. Home-saved seeds are totally free! Seed prices have been rising steadily since 2000 because the cost of breeding seeds for corporations has risen. Now they are bred with traits or genes that have to be bought or leased from gene-tech companies who experiment in high tech super labs, then in glass houses and multiplied in open fields: they are genetically engineered. The costs of commercialising them worldwide with international legal protection has help huge price rise in seeds. (Please google UPOV the international agency based in Switzerland who grants licences and protect the so called intellectual property on seeds to plant breeders, most countries have signed the agreements apart of the GATT protocols). Saving seeds is still free in Australia however it is not in the EU with stringent laws to protect the copyrights owners of seeds! What could be more easy than letting your italian parsley, thai corianders, chicory salads, asian cabbages, japanese mustards run to seed. Let your beans mature on the bush so they are ready to re-plant. Just some staking, a little patience and appreciation for the beauty of plants flowering will yield your very own seed that are getting adapted to your local climate. 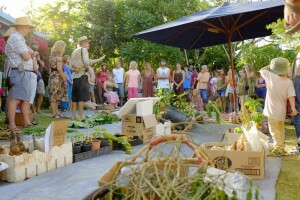 Find out how to save seeds of hundreds of garden vegetables, how to avoid diseases and grow natually the organic way. Some of the seed to start with, you can access from your local seed network. check the google map for finding out. if there is none or if they are too far to travel to start one in your area. Let plants go full cycle! Home seed saving produces extra seeds that you can give away to others. One single lettuce head can produce 100,000 seeds, three Italian purple broccoli more than one kg of seed. That’s 120 grams which is more than you need to exchange in your Local Seed Network for seeds you want. This abundance means there are enough seeds for broadcasting in the garden. Just move seed heads to self-seed in other beds in the gardens. That way you have a kind of rotation system. Save on time and effort! Traditional varieties are generally more nutrient-dense than commercial varieties. Local seed stocks produce gourmet ingredients. Corporate seed companies breed for yield and high response to chemical fertilisers at the expense of taste and nutrition. That way you have to eat more to feel satisfied, hence the increase in obesity. Local varieties come in rainbow colours. Different pigmentations indicate antioxidants best for optimum health. Save on commercial vitamins and minerals! Fresh seeds germinate at a higher percentage and are more vigorous, i.e., they are quicker to-emerge from the soil and more likely to thrive. Saving seeds is all based on careful observation in the gardens. Co-create or tailor-make your own varieties of vegetable by skillfully selecting for desirable characteristics and saving them each year. They will adapt to your local conditions in a few short generations. (If they don’t show sign of adaptation and easy-care replace them with another variety. Feel free to use the seed exchange provided in this site. Visit the Seed Exchange in the Community Forums. Create your own local adaptations! Your home-saved seeds will adapt to resist your local pest and diseases and over time become more hardy. Corporations and foreign governments are investing in millions of acres to plant them with genetically engineered crops. Far from an estimated 8 000 plant species once eaten by man, processed non-foods are largely made from maize, canola, soy, potatoes and cotton seed as oils and fillers, the five main GE crops. Humanity is now being condemned to consume fattening and often allergenic GMOs. By saving your own seeds and improving your skills you can avoid growing and consuming GE food! Local varieties have a rich genetic past as they had to evolve in farmers’ hands with changing climates over thousands of years. They will remain adaptable to future changes compared to uniform highly bred hybrids and genetically modified seeds that are derived from seeds in frozen gene banks. Let your seeds evolve with the changing climate! Bypass corporate monsters such as Monsanto, Bayer and Dupont that sell seed, GE seed, pesticides, fungicides, fertilisers and pharmaceuticals who serve industrial monocultures that aim at global markets. Save your seeds at home! We can’t drop the ball on this one and cause a break in the chain of seeds handed to us by our ancestors. They put so much work into them and our descendants need them and will appreciate them. Leave something good and tasty for your great grandchildren and their friends! It is all free, remember money does not change hands. Producing locally adapted high quality seed is a rare commodity and cost nothing but patience, wether it is in a community gardens, a school or at a small farm level. Imagine this: One lettuce well formed seed head is able to give more than you ever need: up to 120 grammes of seeds three Italian purple broccoli more than one kg of seed ready to sprout: the fresher the seeds the better. Moreover, your efforts can be the start of a seed swap adventure or venture, with other gardeners (or in your local seed network). In contrast one gramme of corporate hybrid tomatoes cost in the vicinity of 30 dollars. (on the basis of 250 to 300 tomato seeds per gramme) not to mention the pesticide to spray over highly-strung varieties of fruit and vegetables. Seed costs have been rising steadily in the last 12 years because corporate seeds bred for traits are owned by gene tech interests and are engineered in super-labs, then glass houses, multiplied in the open and commercialised worldwide with international legal protection (Google UPOV).